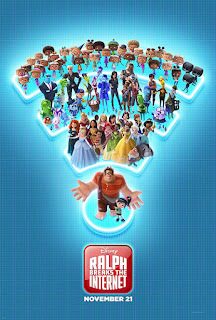 Read Ashley B's review of Ralph Breaks the Internet. In “Ralph Breaks the Internet,” video-game bad guy Ralph (voice of John C. Reilly) and best friend Vanellope von Schweetz (voice of Sarah Silverman) leave the comforts of Litwak’s arcade in an attempt to save her game, Sugar Rush. Their quest takes them to the vast, uncharted world of the internet where they rely on the citizens of the internet—the Netizens—to help navigate their way. Lending a virtual hand are Yesss (voice of Taraji P. Henson), the head algorithm and the heart and soul of the trend-making site “BuzzzTube,” and Shank (voice of Gal Gadot), a tough-as-nails driver from a gritty online auto-racing game called Slaughter Race, a place Vanellope wholeheartedly embraces—so much so that Ralph worries he may lose the only friend he’s ever had. 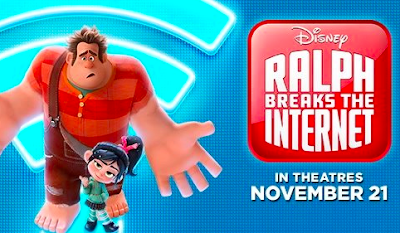 Ralph Breaks the Internet is the sequel to Wreck-It Ralph that follows the title character as he discovers the Internet and all it has to offer. Back with him is his candy racing best friend Venellope and they embark on a Wi-Fi adventure. Can the sequel be just as good (or better) than the first or should Ralph stick to his own game? I have to say that I saw the first movie when it came out and had no interest in watching it again. I was expecting to the same way about this one but ending up liking it much better. The pop culture references and humor were much more appealing. It seemed to piece together more cohesively and not be as jumbled as the first. That is not to say that it still did not have its jumbled moments. The best way I describe it is as a bumpy road where the highs of the movie had me laughing and smiling followed shortly by the lows where I lost interest and wondered when the nearly two hour movie was going to end. There was many scenes that could have cut shorter or deleted altogether. Still I enjoyed Ralph Breaks the Internet more than its predecessor and it has a much better chance of me watching it again. Make sure to stay to the very end of the movie for two post credit scenes!